Free Civil Service Exam reviewers, online quizzes, tips, and tutorials. In the previous post, we have learned how to multiply fractions. We have learned that it is the easiest operation on fractions. To multiply fraction, we just have to multiply the numerators and then the denominators. That is a fraction multiplied by is equal to . Below are the exercises on multiplying fractions. Multiply the fractions and reduce your answers to the lowest terms. If the answer is an improper fraction, convert the improper fraction to mixed fraction. Among the four fundamental operations on fractions, multiplication is the easiest. It is just simple. Multiply the numerator and then the denominator. Of course, if the given fractions can be converted to lowest terms, the easier the multiplication will be. In this post, we are going to learn how to multiply fractions. You must master this operation, as well as other fundamental operations on fractions because you will use them in higher mathematics and solving word problems. Below are some examples. This is the complete solutions and answers to the Practice Test on Converting Improper Fraction to Mixed Number. As illustrated in the image below, the quotient in the division becomes the whole number in the mixed fraction, the remainder in the division becomes the numerator of the fraction part of mixed fraction, and the denominator from the improper fraction becomes the denominator of the fractional part of the mixed fraction. In the solutions below, all answers were also reduced to lowest terms. In the previous post, we have learned how to convert improper fractions to mixed number . Now, try the following exercises. All the answers must also be reduced to lowest terms. Good luck. In Introduction to Functions, we have learned about proper and improper fractions. A fraction whose numerator (the number above the fraction bar) is less than its denominator (the number below the fraction bar) is called a proper fraction. Therefore, , and are proper fractions. On the other hand, a fraction whose numerator is greater than its denominator is called an improper fraction. Therefore the fractions , and are improper fractions. In the Civil Service Examinations, some fractions need to be converted from one form to another. For example, in answering a number series test, you might need to convert an improper fraction to mixed form in order to compare it to other fractions in mixed form. 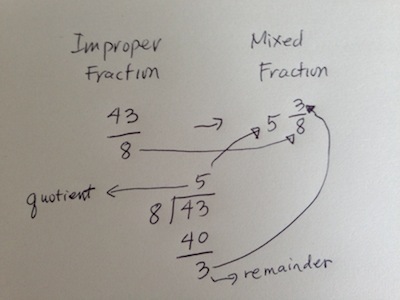 In this post, we learn this method: how to convert an improper fraction to mixed form. Below are the complete solutions and answers to the exercises on reducing fractions to lowest terms. I will not give any tips or methods of shortcuts on doing this because teaching you shortcuts will give you problems in case you forget them. The best thing that you can do is to solve as many related problems as you can and develop shortcuts that work for you. Each person has his own preference in solving procedural problems such as these, so it is important that you discover what’s best for you. In the previous post, we learned how to convert fractions to lowest terms. In this post, I have created 15 exercises for you to practice. Convert the following fractions to lowest terms. In case the fraction is improper, convert it to mixed form. Be sure that the fraction part is in lowest terms. In the Civil Service Examination and in many mathematics examinations, results that are fractions are usually required to be converted to their lowest terms. The numerator and the denominator of a fraction in lowest terms cannot be divided by any similar integer. Knowledge of divisibility rules can be helpful in this process. Example 1: Convert to lowest terms. In the first example, we can see that the numerator and the denominator are both divisible by 3. Dividing both the numerator and the denominator by 3 gives us 2/3.